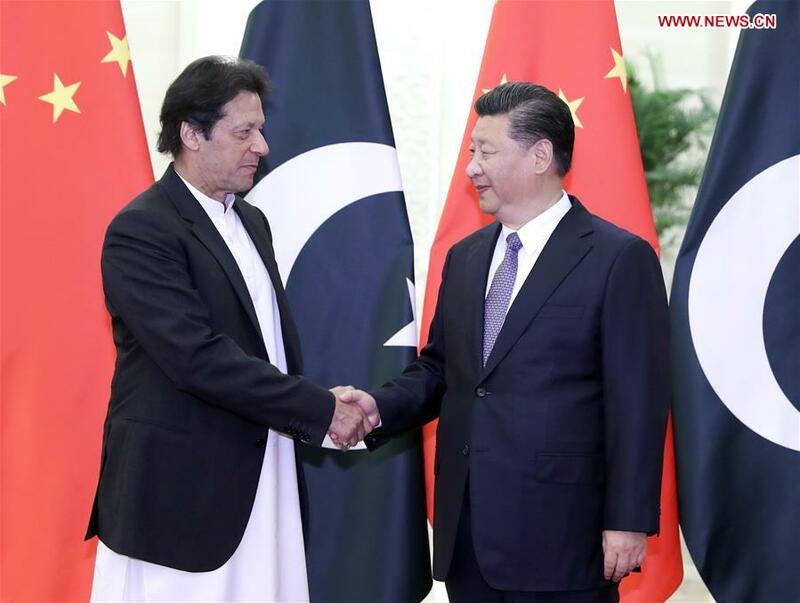 BEIJING, Nov. 2 (Xinhua) — Chinese President Xi Jinping met with Pakistani Prime Minister Imran Khan in Beijing Friday. Xi welcomed Khan for paying an official visit to China and attending the first China International Import Expo. He hailed the China-Pakistan all-weather strategic cooperative partnership as a special friendship shaped and developed during a long time of mutual support and close cooperation. Xi said the bilateral ties always stay vigorous and continue developing regardless of the changes in international situations or the two countries’ domestic affairs. “China-Pakistan cooperation not only benefits both peoples but also contributes to regional and world peace, stability and development,” Xi said. Xi appreciated Khan for repeatedly stressing that he would view the relations with China as a political cornerstone in Pakistan’s foreign policy and would unswervingly promote the construction of the China-Pakistan Economic Corridor (CPEC). Xi said China always views relations with Pakistan as a priority of diplomacy and supports Pakistan in safeguarding national independence, sovereignty and territorial integrity. He also expressed support for Pakistan’s new government in implementing its policies and promoting national development. Xi said the two sides should deepen strategic communication, maintain regular visits and meetings between the two countries’ leaders and enhance experience-sharing in the governance of a country. Proposing closer pragmatic cooperation and promotion in trade and investment, Xi called for consolidating the early results of CPEC and expanding CPEC to areas such as industrial parks and people’s livelihood. He also said the two sides should boost people-to-people exchanges, strengthen anti-terrorism cooperation and increase coordination and communication on multilateral platforms such as the United Nations and the Shanghai Cooperation Organization. Pakistan admires China’s development achievements and hopes to learn from China’s experience in development, poverty alleviation and anti-corruption, Khan said. “Pakistan-China friendship is deeply rooted in the mind of Pakistani people,” Khan said, noting that Pakistan is devoted to furthering the relations with China and the construction of CPEC, so as to benefit the economic and social development of Pakistan. The Pakistani side is willing to reinforce communication and coordination in multilateral affairs with China, Khan added.